PRESENTED BY: PROF. S. Y. MENSAH F.A.A.S; F.G.A.A.S UNIVERSITY OF CAPE COAST, GHANA. 1 PRESENTED BY: PROF. S. Y. MENSAH F.A.A.S; F.G.A.A.S UNIVERSITY OF CAPE COAST, GHANA. 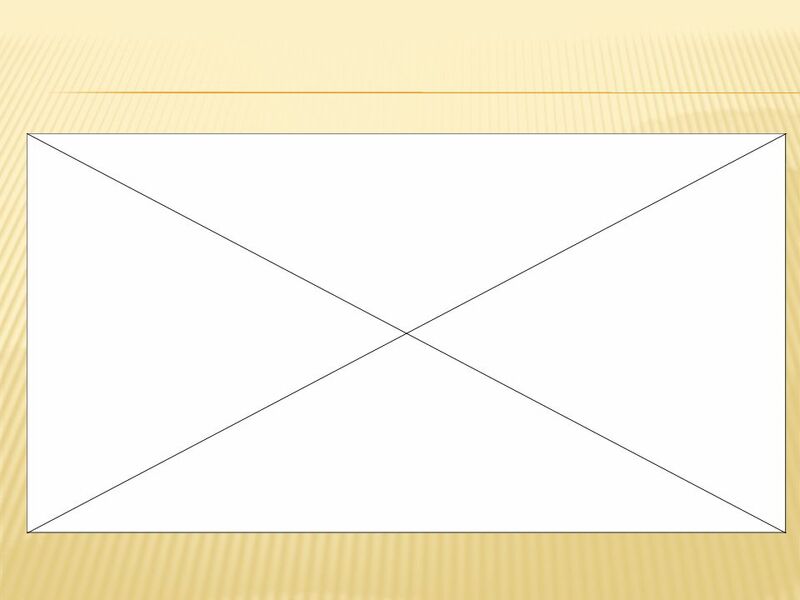 2  Objective of the work. 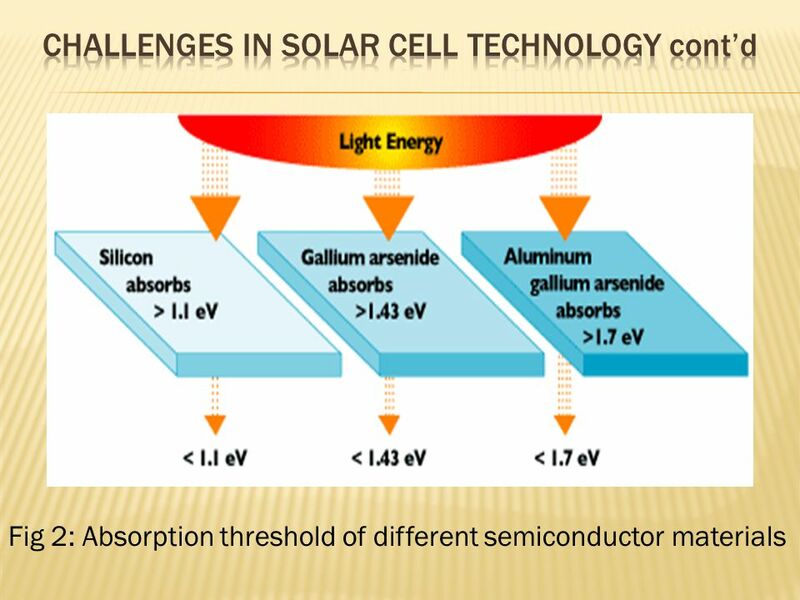  A brief introduction to Solar Cell technology  Challenges in solar cell technology. 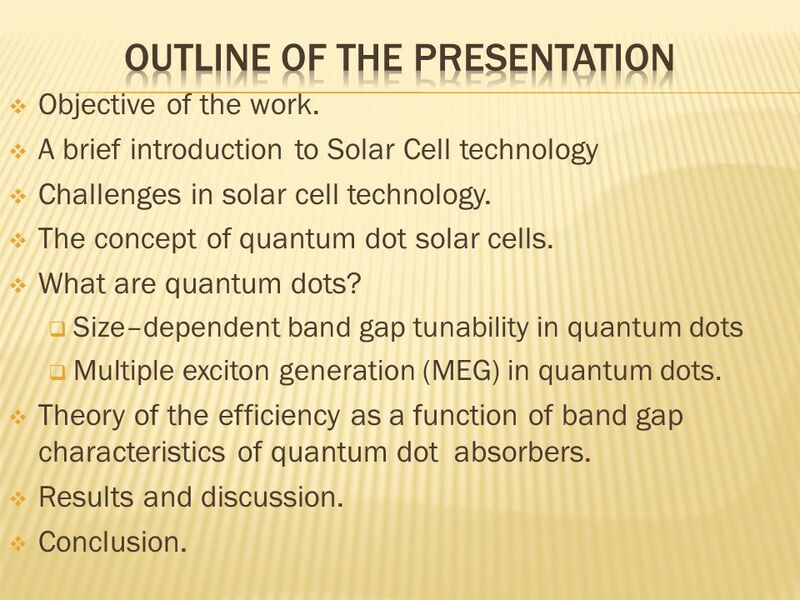  The concept of quantum dot solar cells.  What are quantum dots?  Size–dependent band gap tunability in quantum dots  Multiple exciton generation (MEG) in quantum dots. 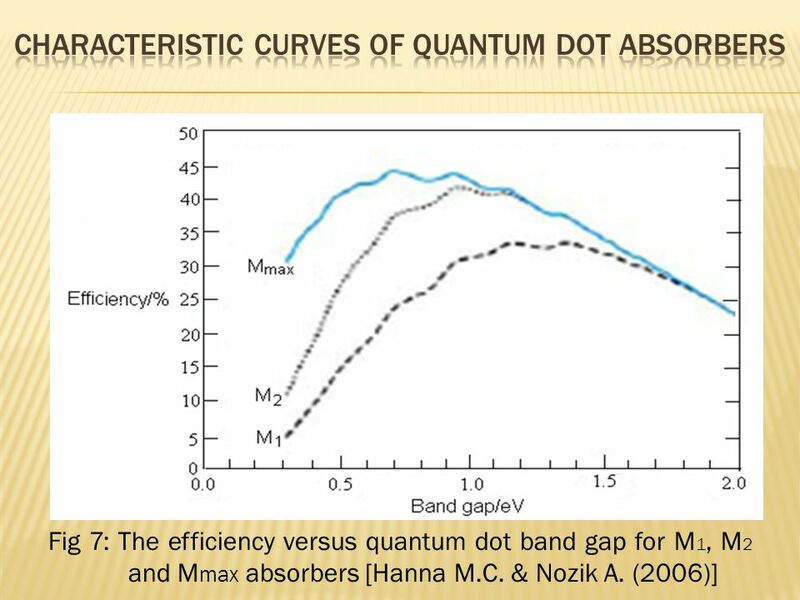  Theory of the efficiency as a function of band gap characteristics of quantum dot absorbers.  Results and discussion. 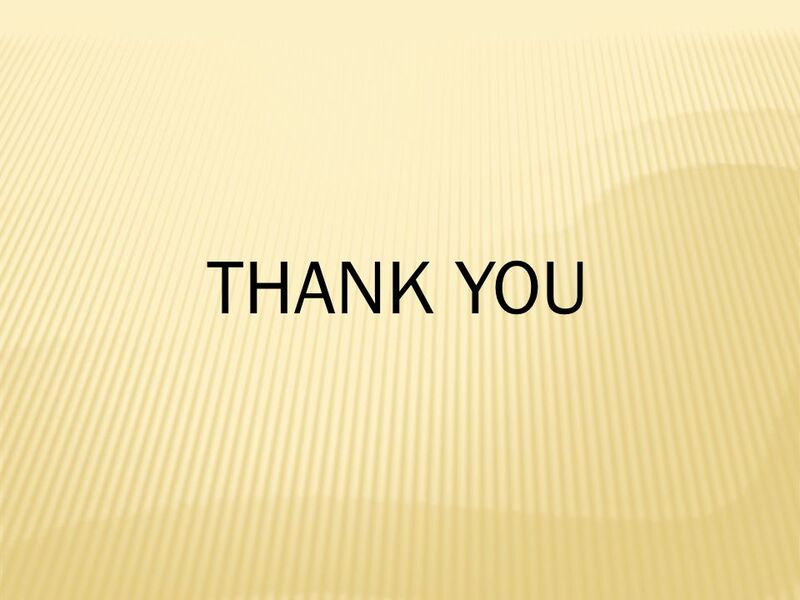  Conclusion. 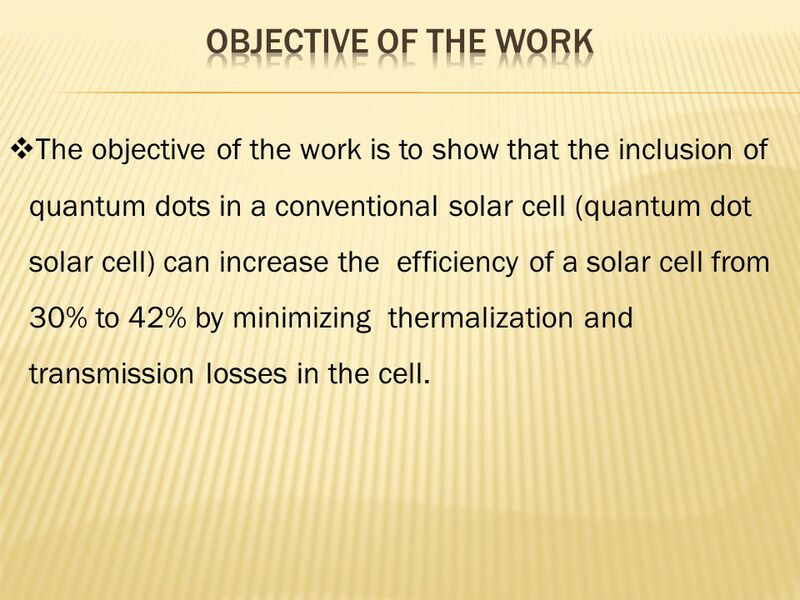 4  The objective of the work is to show that the inclusion of quantum dots in a conventional solar cell (quantum dot solar cell) can increase the efficiency of a solar cell from 30% to 42% by minimizing thermalization and transmission losses in the cell. 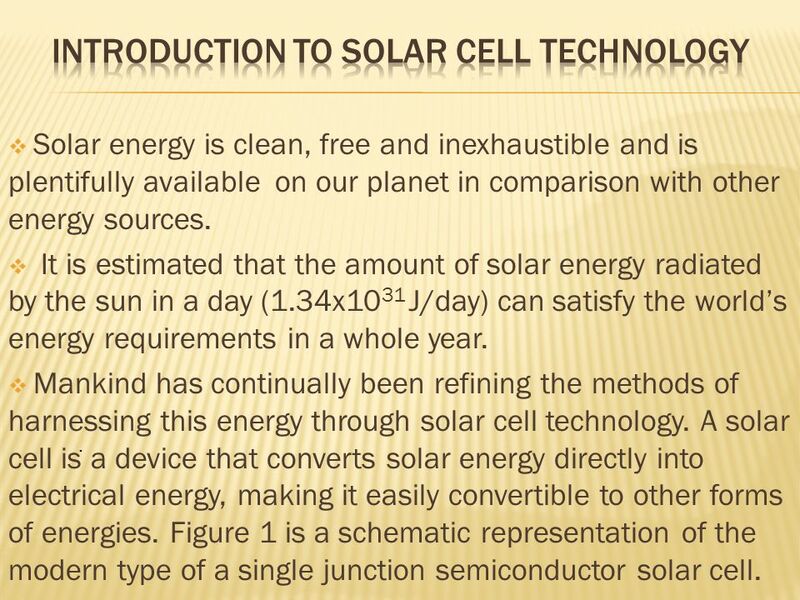 5  Solar energy is clean, free and inexhaustible and is plentifully available on our planet in comparison with other energy sources.  It is estimated that the amount of solar energy radiated by the sun in a day (1.34x10 31 J/day) can satisfy the world’s energy requirements in a whole year. 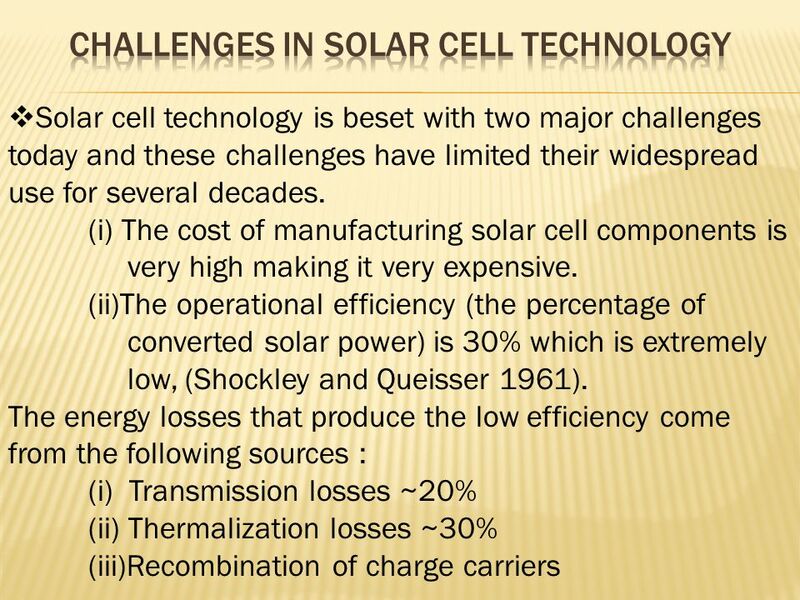  Mankind has continually been refining the methods of harnessing this energy through solar cell technology. 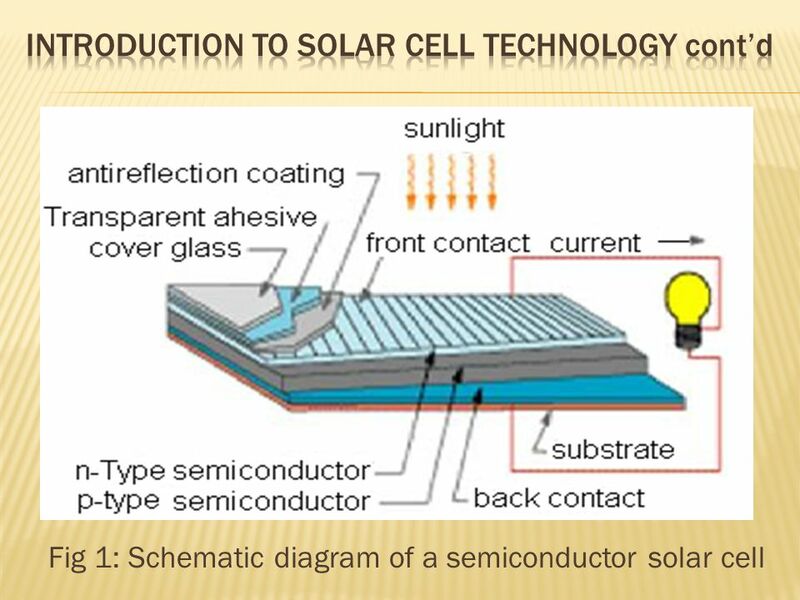 A solar cell is a device that converts solar energy directly into electrical energy, making it easily convertible to other forms of energies. Figure 1 is a schematic representation of the modern type of a single junction semiconductor solar cell..
8 (iv) Reflection of sunlight at the solar cell surface (v) Resistance and temperature effects  The last two losses have been fairly addressed and so the low efficiency is mainly due to the first three losses. 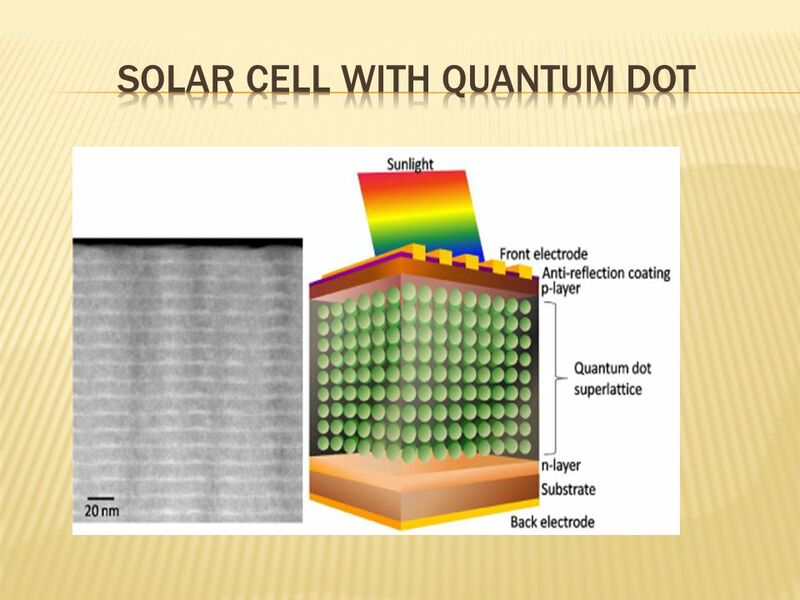  This research is an attempt to minimize transmission and thermalization losses using quantum dots. 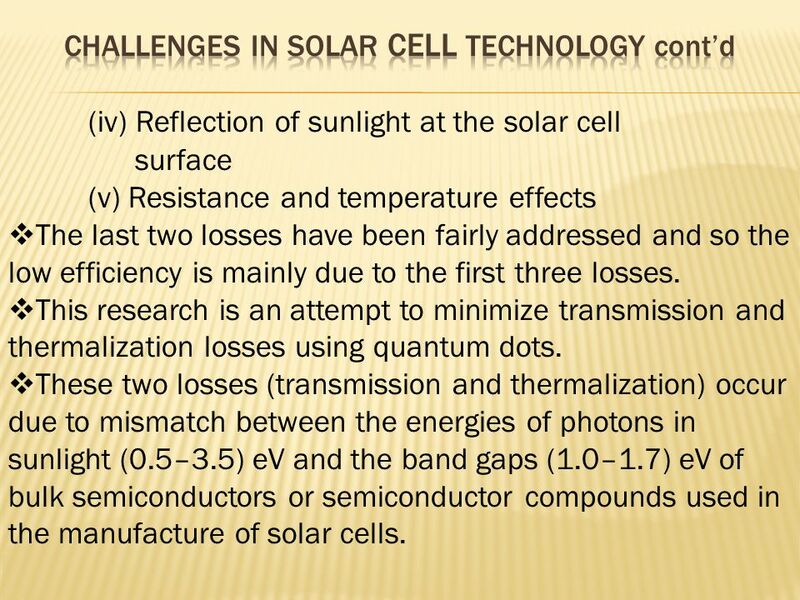  These two losses (transmission and thermalization) occur due to mismatch between the energies of photons in sunlight (0.5–3.5) eV and the band gaps (1.0–1.7) eV of bulk semiconductors or semiconductor compounds used in the manufacture of solar cells. 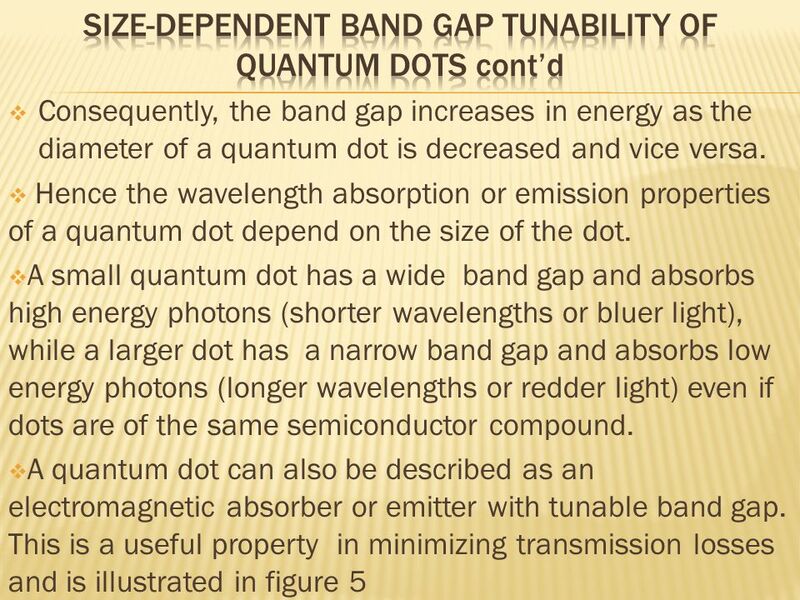 9  Only photons with energies equal to the material’s band gap are efficiently utilized to generate electrical energy. 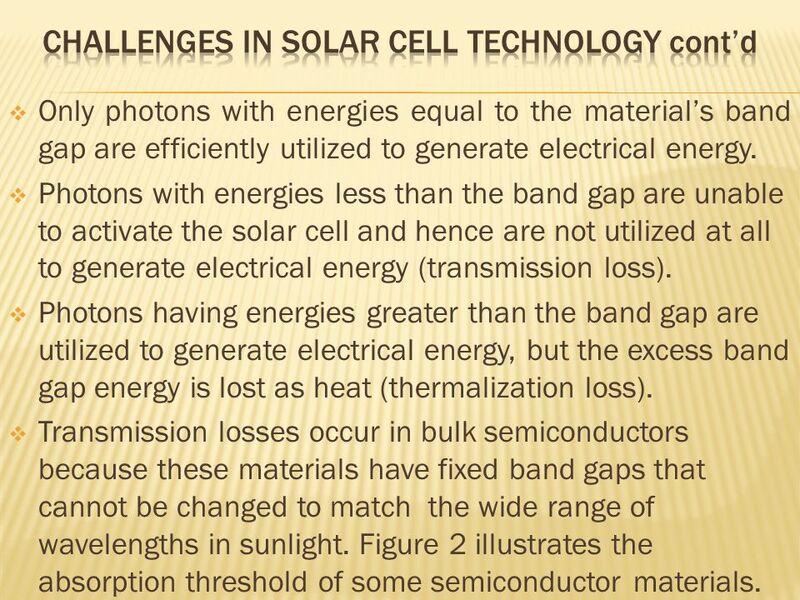  Photons with energies less than the band gap are unable to activate the solar cell and hence are not utilized at all to generate electrical energy (transmission loss). 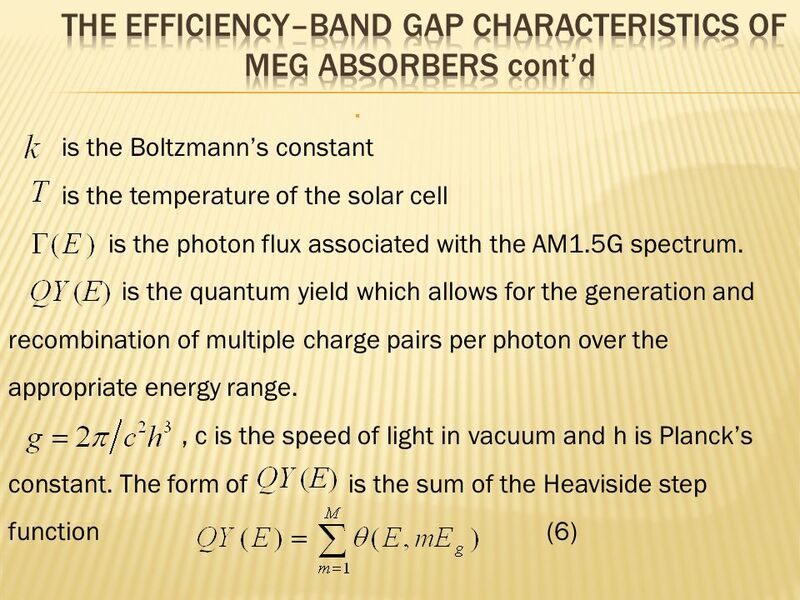  Photons having energies greater than the band gap are utilized to generate electrical energy, but the excess band gap energy is lost as heat (thermalization loss). 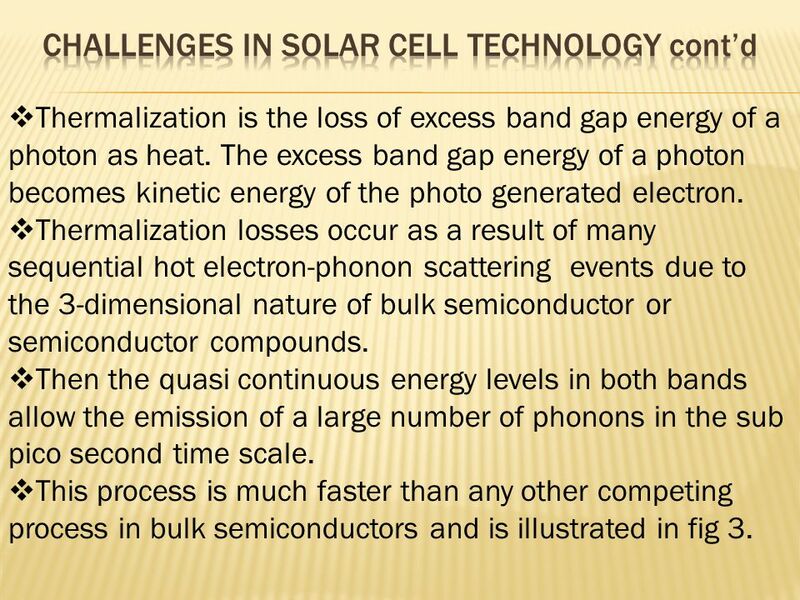  Transmission losses occur in bulk semiconductors because these materials have fixed band gaps that cannot be changed to match the wide range of wavelengths in sunlight. Figure 2 illustrates the absorption threshold of some semiconductor materials. 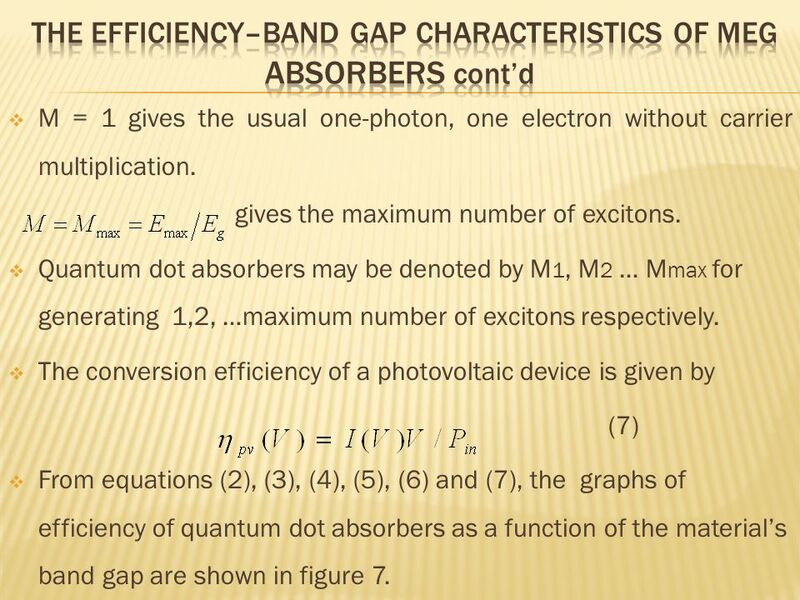 11  Thermalization is the loss of excess band gap energy of a photon as heat. 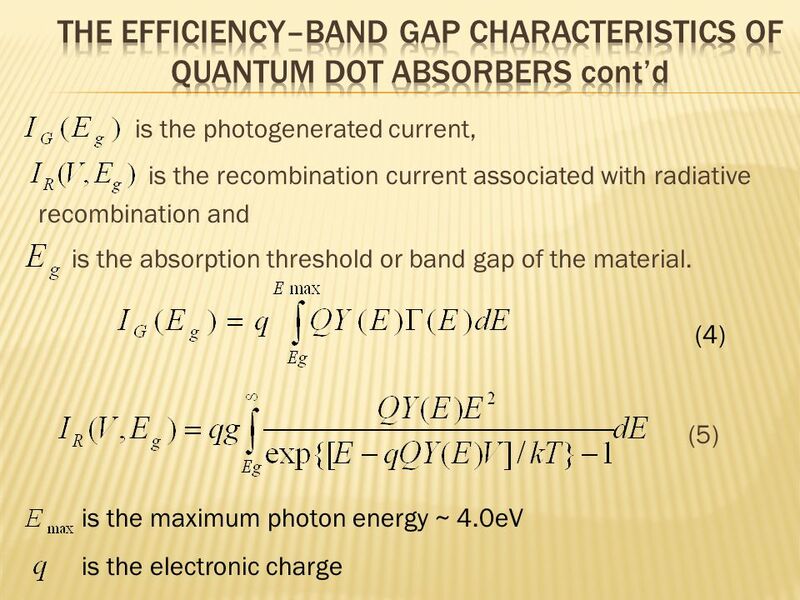 The excess band gap energy of a photon becomes kinetic energy of the photo generated electron. 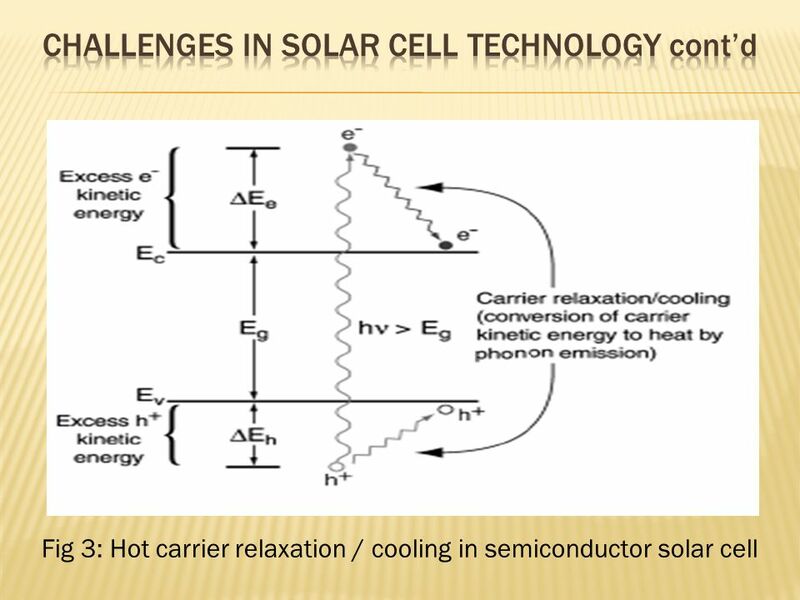  Thermalization losses occur as a result of many sequential hot electron-phonon scattering events due to the 3-dimensional nature of bulk semiconductor or semiconductor compounds.  Then the quasi continuous energy levels in both bands allow the emission of a large number of phonons in the sub pico second time scale.  This process is much faster than any other competing process in bulk semiconductors and is illustrated in fig 3. 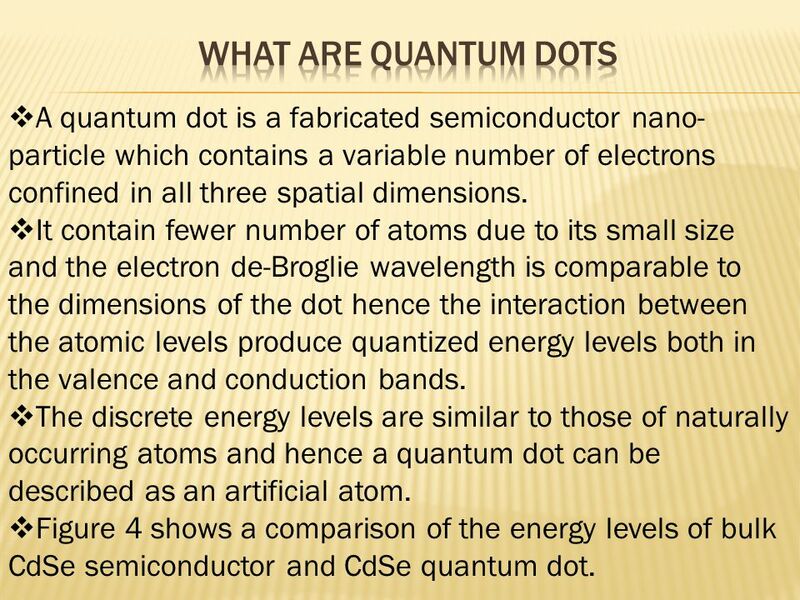 15  A quantum dot is a fabricated semiconductor nano- particle which contains a variable number of electrons confined in all three spatial dimensions.  It contain fewer number of atoms due to its small size and the electron de-Broglie wavelength is comparable to the dimensions of the dot hence the interaction between the atomic levels produce quantized energy levels both in the valence and conduction bands.  The discrete energy levels are similar to those of naturally occurring atoms and hence a quantum dot can be described as an artificial atom. 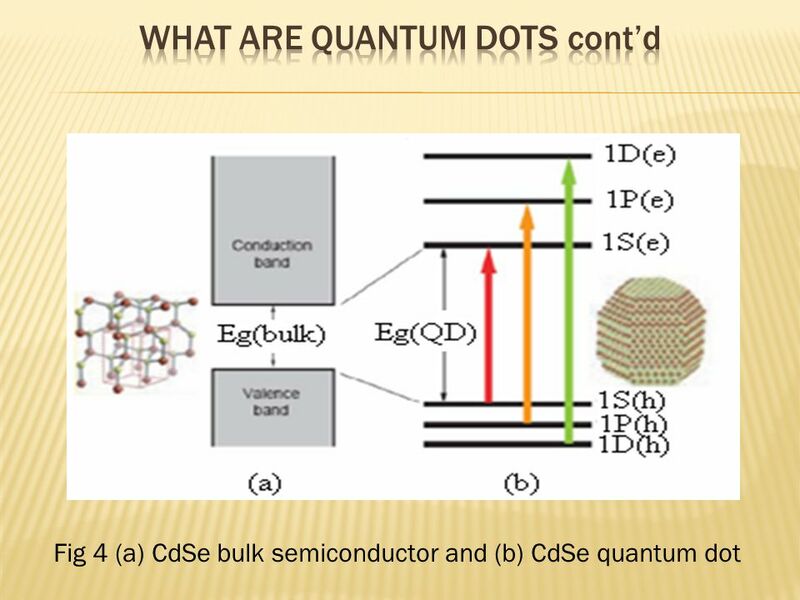  Figure 4 shows a comparison of the energy levels of bulk CdSe semiconductor and CdSe quantum dot. 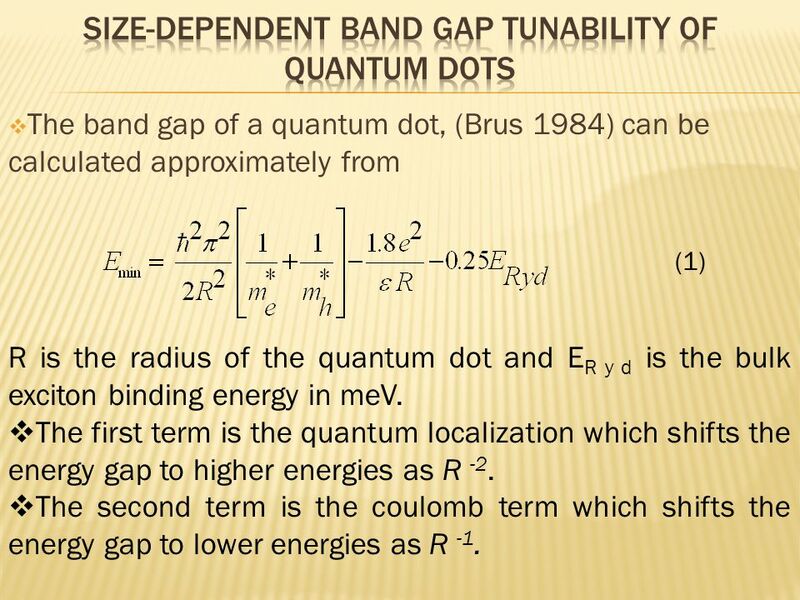 17  The band gap of a quantum dot, (Brus 1984) can be calculated approximately from (1) R is the radius of the quantum dot and E R y d is the bulk exciton binding energy in meV.  The first term is the quantum localization which shifts the energy gap to higher energies as R -2.  The second term is the coulomb term which shifts the energy gap to lower energies as R -1. 19 Fig 5: Matching of the output colour and the quantum dot size. 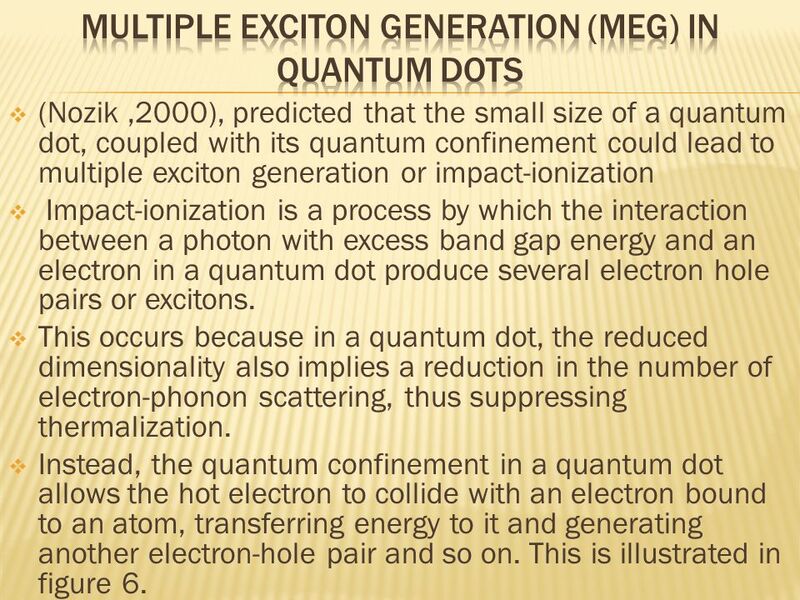 20  (Nozik,2000), predicted that the small size of a quantum dot, coupled with its quantum confinement could lead to multiple exciton generation or impact-ionization  Impact-ionization is a process by which the interaction between a photon with excess band gap energy and an electron in a quantum dot produce several electron hole pairs or excitons. 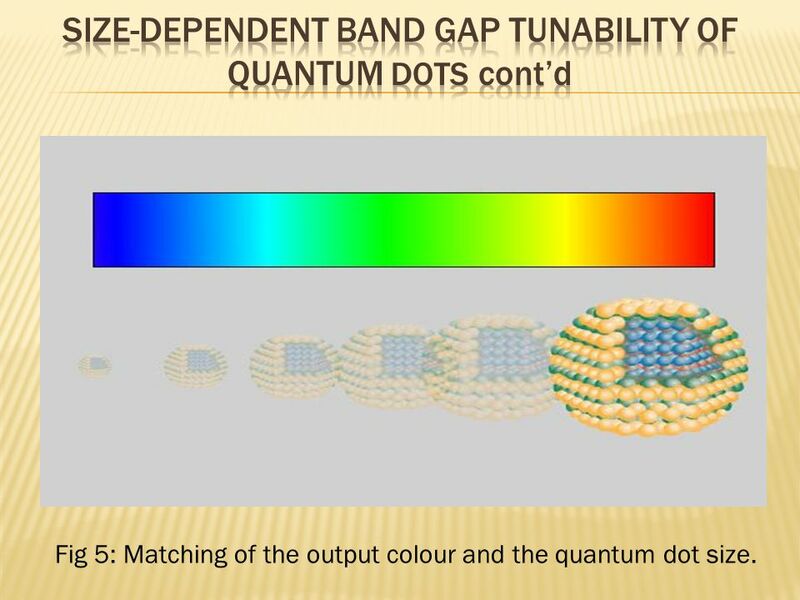  This occurs because in a quantum dot, the reduced dimensionality also implies a reduction in the number of electron-phonon scattering, thus suppressing thermalization.  Instead, the quantum confinement in a quantum dot allows the hot electron to collide with an electron bound to an atom, transferring energy to it and generating another electron-hole pair and so on. This is illustrated in figure 6. 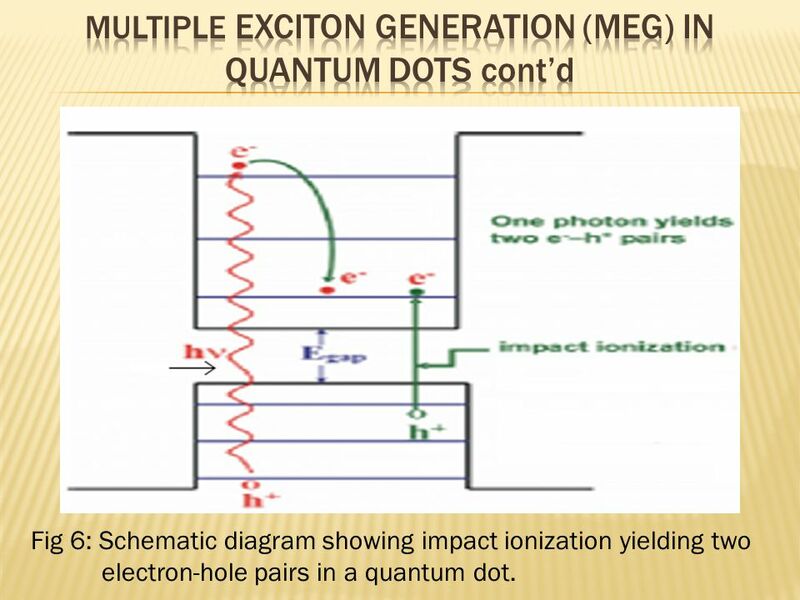 21 Fig 6: Schematic diagram showing impact ionization yielding two electron-hole pairs in a quantum dot. 22  Experimental results involving the interaction between high energy photons and several quantum dot materials demonstrate that impact-ionization is practical. 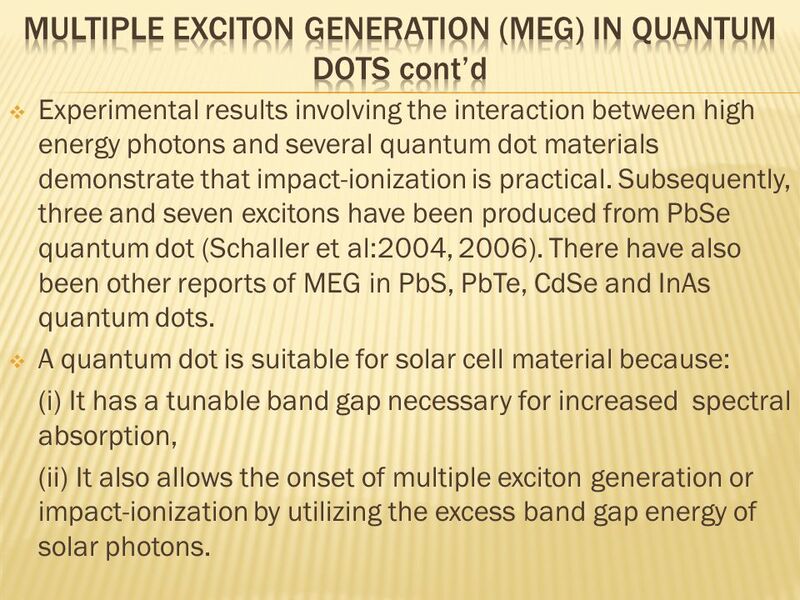 Subsequently, three and seven excitons have been produced from PbSe quantum dot (Schaller et al:2004, 2006). There have also been other reports of MEG in PbS, PbTe, CdSe and InAs quantum dots. 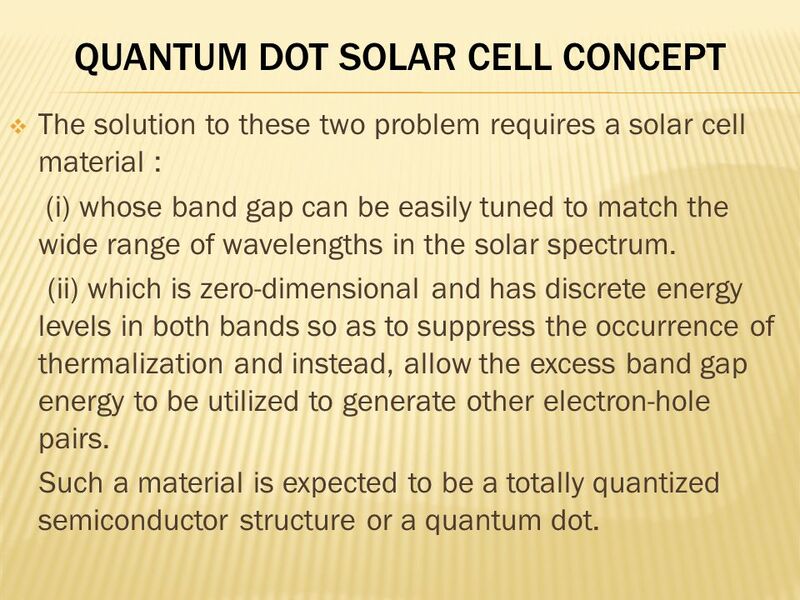  A quantum dot is suitable for solar cell material because: (i) It has a tunable band gap necessary for increased spectral absorption, (ii) It also allows the onset of multiple exciton generation or impact-ionization by utilizing the excess band gap energy of solar photons. 26  M = 1 gives the usual one-photon, one electron without carrier multiplication. gives the maximum number of excitons. 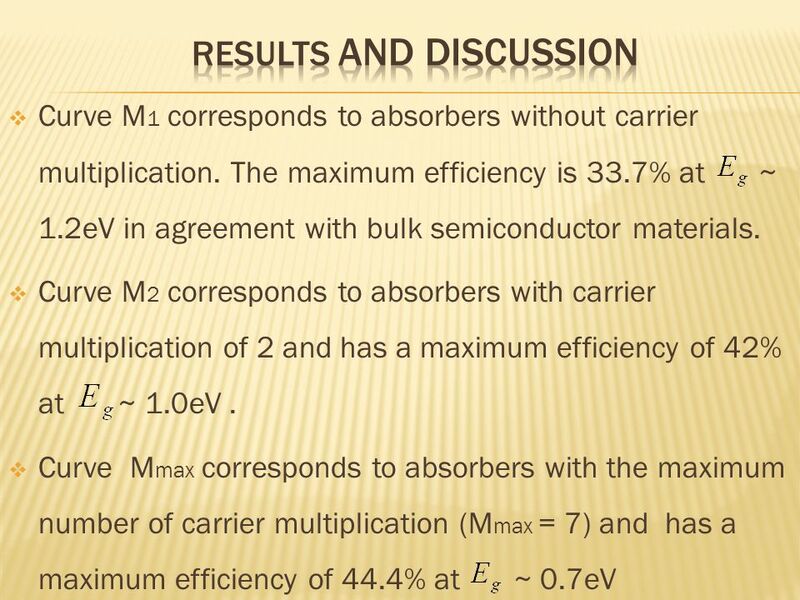  Quantum dot absorbers may be denoted by M 1, M 2 … M max for generating 1,2, …maximum number of excitons respectively. 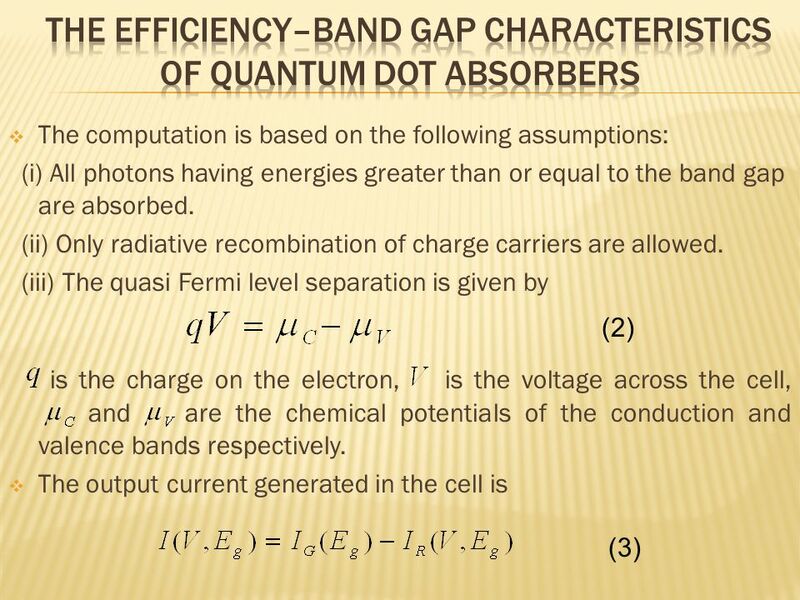  The conversion efficiency of a photovoltaic device is given by (7)  From equations (2), (3), (4), (5), (6) and (7), the graphs of efficiency of quantum dot absorbers as a function of the material’s band gap are shown in figure 7. 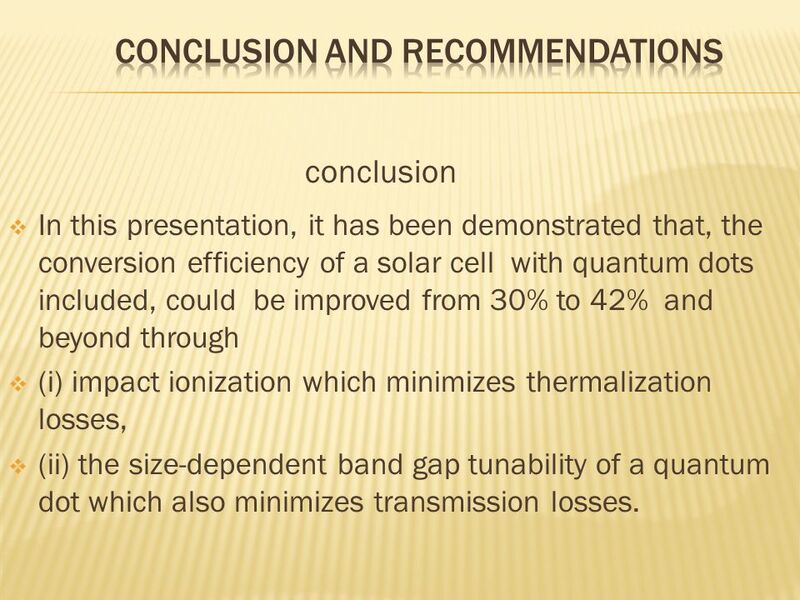 29 conclusion  In this presentation, it has been demonstrated that, the conversion efficiency of a solar cell with quantum dots included, could be improved from 30% to 42% and beyond through  (i) impact ionization which minimizes thermalization losses,  (ii) the size-dependent band gap tunability of a quantum dot which also minimizes transmission losses. 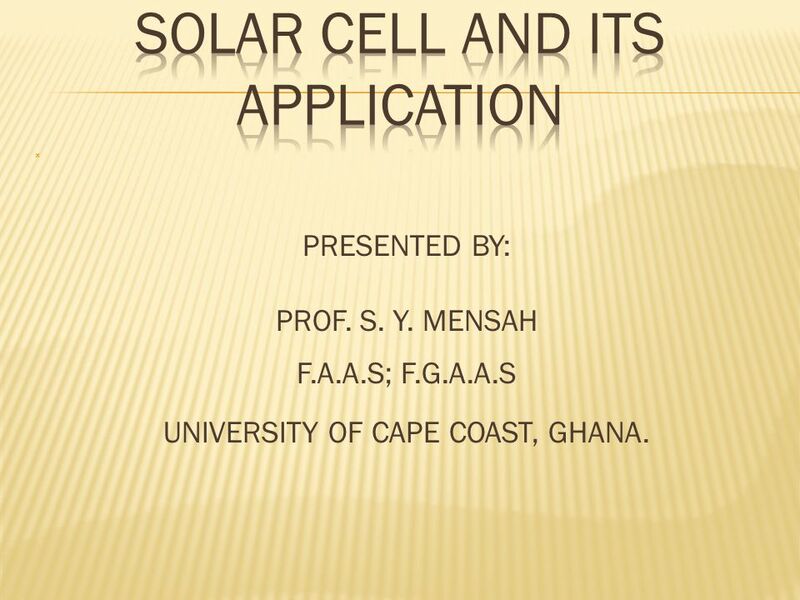 Download ppt "PRESENTED BY: PROF. S. Y. MENSAH F.A.A.S; F.G.A.A.S UNIVERSITY OF CAPE COAST, GHANA." LECTURE- 5 CONTENTS  PHOTOCONDUCTING MATERIALS  CONSTRUCTION OF PHOTOCONDUCTING MATERIALS  APPLICATIONS OF PHOTOCONDUCTING MATERIALS. Black body radiation BBR is the radiation emitted by a non-reflecting solid body. A perfect black body is one which absorbs all the radiations falling. METO 621 Lesson 6. Absorption by gaseous species Particles in the atmosphere are absorbers of radiation. Absorption is inherently a quantum process. A.
James McDaniel Physics 3500 Nanochemistry Quantum Dots: Science and Applications. Semiconductor Light Detectors ISAT 300 Foundations of Instrumentation and Measurement D. J. Lawrence Spring 1999. What are the 3 ways heat can be transferred? Radiation: transfer by electromagnetic waves. Conduction: transfer by molecular collisions. Convection: transfer. Space-Separated Quantum Cutting Anthony Yeh EE C235, Spring 2009. Physics 213 General Physics Lecture 22. 1 Exam 3 Results Average = 141 points.